THE CITY AS an icon. Whether you have been to Venice or not, you know it well. We all carry the image of the floating city with us everywhere. 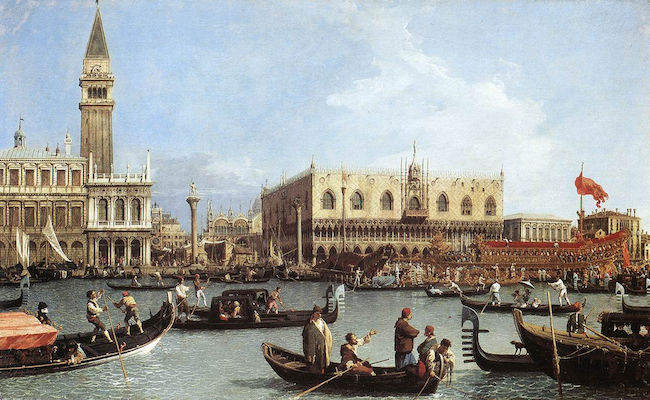 The famous Piazza San Marco, for example, is perhaps the only completely internalized image that, when first seen by a visitor, easily exceeds the most febrile expectation, even if that expectation were first planted by Canaletto himself. And thus, with each revisit, as Ruskin saw, the ‘ancient fabric’ is replaced, the icon is suddenly restored, venerated anew, and made assertive. It is the capital city of the high-cultural empire in which we live. A Venetian’s view of Venice, by Michele Casagrande. City for sale, by Robin Saikia. Venice and the theatre of memory, images by Gigi Bon and text by Hoyt Rogers. Images of Venice, by Alvise Nicoletti. See below. Alvise Nicoletti for The Fortnightly Review. The images and content of this dossier are protected by copyright 2014. All rights are reserved. Support the Save Venice Foundation (US) and Venice in Peril (UK). Alvise Nicoletti is one of the leading photographers in Venice, where his family has lived for centuries. In 2004 he received his first degree in Web Design, followed by a Master’s in Photography from the European Institute of Design. He has worked as a photographer for many cultural institutions, including the Dance, Music and Theatre Division of the Venice Biennale. He also serves as a photographer and web designer for the company ELAN42.com, a network of professionals who work together without giving up their independence. This Fortnightly Review article is filed under the following rubrics: Art & Architecture, History & Travel, Venice portfolio. Publication: Saturday, 5 July 2014, at 11:08. ‹ Venice and the theatre of memory.